USS Sterett (DD 407) stands off Mare Island, 6 February 1943. Images of Sterett during World War II. Click on any ship image to view it in more detail. The second USS Sterett (DD 407), one of three 1,500-tonners awarded the Presidential Unit Citation, operated in the Atlantic through early 1942 but thereafter saw action in every remaining phase of the Pacific war. 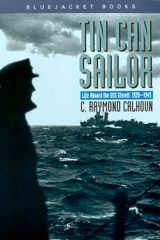 Tin Can Sailor: Life Aboard the USS Sterett, 1939–1945 by Sterett’s gunnery officer at Guadalcanal, C. Raymond Calhoun. Laid down on 2 December 1936 at the Charleston Navy Yard, she was sponsored at her launch on 27 October 1938 by Mrs. Camilla Ridgely Simpson, and commissioned on 15 August 1939, LCdr. Atherton Macondray in command. Sterett departed Charleston on 28 October 1939 in company with Hughes and Mustin, which were also newly-commissioned, for shakedown in the Gulf of Mexico. She visited Vera Cruz, Cristobal, Mobile, and Guantánamo Bay before returning to Charleston on 20 December. She underwent post-shakedown overhaul and trials at Charleston until departing on 4 May 1940. Assigned to DesDiv 15, Sterett rendezvoused with Hammann at Guantánamo Bay, and the two destroyers steamed for San Diego, via the Panama Canal. They arrived in San Diego on 23 May; and, for a month, Sterett divided her time between training and planeguarding Enterprise (CV 6). On 24 June, she sailed for Hawaii with Enterprise and five other destroyers, and arrived at Pearl Harbor on 2 July. Visit the Sterett Association web site.